It's about a one and a half hour train ride from Lucca to Firenze. Last year we had stayed at the Hotel Londra Palace in Venezia. They had suggested that we consider staying at J.K.Place in Firenze, which is under the same ownership. We had found Londra Palace to be exceptional in all respects, so we reserved at J.K.Place in Firenze this year. It was a 5 minute walk from the Santa Maria Novella train station to number 7 Piazza Santa Maria Novella, J.K.Place. 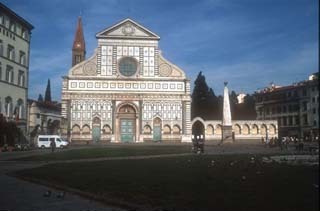 The large piazza is dominated by the white and green marble Gothic-Romanesque facade of the Chiese e Museo of Santa Maria Novella. Many of the buildings surrounding the square are being renovated, which will greatly enhance its beauty. J.K.Place was one of the recent renovations, turning a previous apartment building into an island of beauty and serenity in a sea of busy life. We were looking for the usual blatantly obvious front door of most hotels and consequently walked by twice before realizing that a simple, unobtrusive door provided access to the twenty room, including four junior suites, treasure place. A black wooden floor corridor led past a sitting room which stopped us in our tracks. Straight ahead was a Charles X fireplace with a 60's Lalique clock and a feathered headdress of a Zairian chieftain gracing the top. Two large 19th century wood framed mirrors hung on either side of the fireplace and an Oriental black lacquer table featuring fifties-style table lamps. The cream and ivory-gray sofas at the fireplace were arranged around an Art Deco zebra-skin ottoman. This room set the tone for the design surprises that awaited us. Classic, modern, and high tech are harmoniously blended to create an elegant oasis. As we stood admiring the sitting room we were joined by a member of the staff who invited us to sit down and have a beverage while he informed reception of our arrival. He took charge of our luggage and brought us excellent cappuccini. The service is as impeccable as the attention to detail. There are twenty staff members for twenty rooms. The reception desk is located in the stunning black wooded library. Behind the desk is a Regency fireplace over which hangs a work in tempera done in the 80's. The shelves are filled with books, CDs and DVDs all available to the guests, (there are CD and DVD players in each room). There is lovely sculpture on the reception desk and featured reading material. At the end of the corridor, just past the library, in what had been an internal courtyard, is the breakfast room with a floor of Pietra Serena, (also known as Firenzuola stone from the Alto Mugello zone of Tuscana). A glass dome now encloses the space. A very large 19th century walnut table with Chinese inspired chairs and 19th century copper lanterns sit in the middle of the room. Breakfast treats, day-long offerings of snacks and beverages, and house made cake in the afternoon, await guests pleasure on the sideboard along one wall. Beyond the breakfast room is a lovely drawing room. Comfortable sofas line the walls fronted by 19th century Oriental tables and armchairs from the 40's. There are a few Baldini canvases on the walls. History, nostalgia and art are everywhere. Let's not forget today, a giant TV is centered on the rear wall and a laptop computer is available for guest use. This is the perfect venue for snacking and socializing. The main staircase, of Pietra Serena with iron railings, was so inviting we never used the elevator. The landings, walls and steps are beautifully adorned with art, lanterns, sculpture and plants. Our room on the first floor epitomized luxury, tranquility and comfort. The king bed, linens, drapes, carpet, crafted woodwork, furniture and accessories were a blend of soft cream and light gray with silver highlights. All the fabrics and furniture were of the finest quality. The large closet contained extra bedding, safe, DVD player and mini bar, the contents of which are free of charge. There is a large shade over the bed with one light bulb which not only provides a dramatic design effect but also excellent lighting. A platter of really fresh fruit had been placed on the window sill with the courtyard view beyond. The bathroom was done in cream colored textured marble. The bathrobes, slippers and towels were top of the line as was the large bottles of lotions, shampoos and bath gels. Even the fine milled soaps are worthy of special mention. There is a marvelous terrace on the top floor that not only affords great views of the city skyline but is an oasis of comfort with smart sofas, chairs and tables. In between exploring the hotel and enjoying its hospitality we managed to squeeze in lunch at Osteria delle Donne at number 16r on the street of the same name. This small place is littered with an eclectic assortment of pictures, wine, produce and cooking implements. Communal seating packs in as many seats as is possible. It's a busy, fun place with less than average food at relatively low prices - you get what you pay for. Dinner was a much more favorable experience, to say the least, as we dined at the very special Ristorante Buca Lapi, Via del Trebbio 1 - Palazzo Antinori. Be sure to call 055-213768 for reservations. We always find our way down the long flight of steps to the cave below to enjoy hearty Tuscan delights. Buca Lapi is actually located in the ancient cellars of Palazzo Antinori and is the oldest restaurant in Firenze. To have survived after being the first means you have to be very, very good - consistently. Buca Lapi is just that. Fortunately we had our hotel make reservations because no sooner had we arrived, the place was filled to capacity. The sight of the open kitchen and happy cooking staff preparing the finest meats and produce of the region always delights us. The arched ceilings and walls are covered with posters from all around the world creating a colorful and interesting scene. Over the years we have been delighted with many of the menu choices - starters like misto di salumi or crostone con zucchini e accuighe, primi of minestrone di ceci e cavolo, ribollita or tortelli di ricotta e spinaci all'olio e salva, secondi of osso bucco di vitella, anatra nostrace in casseruola con cipolline or stufato di pollo alla cacciatora. And let's not forget some of the exquisite choices from the fritto menu such as coniglio fritto con carciofi and braciola con pomodoro basilico e capperi. We were looking forward to once again enjoying what we consider to be the finest bistecca we've had in Italy. First, a good wine selection. Our host, Lucchiano, has always chosen well for us and tonight was no exception. A Bocca di Lupo 2001, Tormaresca, from an Antinori farm in Apulo, was a superior rich full bodied red that had been aged in wood for one year. Next, a few starting delights before the big show. We munched on crispy carciofi fritti (fried artichoke) until our pasta course arrived. When the carciofi is this perfect, it is addictive. We fought off the urge for a re-order. The portions are very substantial here so we shared one order of pappardelle fresche al cinghiale. The fresh wide ribbon noodles are themselves a treat but combining them with rich wild boar sauce is sheer ecstasy. Every waiter here is an affable and cheerful artist. An artist with a sharp knife who can gracefully and gently remove the thick cut of bistecca from the bone, slice it into filets and arrange it gracefully on your plate before your ravenous eyes. Our waiter was quite skilled and performed the task with ease. Experience had taught us that the bistecca for one is easily shareable. It's one thing to have the best quality meat, another to serve it properly, but what happens in between is what separates the men from the boys. The grilling must result in a crisp exterior and a rare juicy interior without compromising the natural tenderness and flavor. Nobody does it better than Buca Lapi. A side of spinachi aglio e olio provided a healthy complement. It was Valentines Day so it was only appropriate to treat ourselves to the awesome chocolate fudge cake that is really the main reason we come here. It was a slow and easy meal with ample time between courses to sip our wine and enjoy a bit of conversation with our neighbors. The service is excellent and the prices quite reasonable for this quality of dining. Back at J.K.Place we made the decision to have breakfast in bed, which service is complimentary. Semi-reclining, we enjoyed breads, pastries, fresh fruit, freshly squeezed blood orange juice, egg white omelets along with delicious ricotta cheese. It was so nice we repeated it the next morning! The last and only time we saw "David" at the Galleria dell'Accademia on via Ricasoli was some twenty years ago. Now that he had been bathed, we thought it was time to renew our acquaintance. He stands as tall and imposingly handsome as we remembered. David is one of those works of art that must be seen at least once in a lifetime. Firenze is a special place for buying jewelry. It can be a harrowing experience because of the sheer number of stores from which to choose and trying to decide where you are most comfortable making your purchase. It usually boils down to finding a person whose products you like and whom you trust. Some years ago we found our guy, Jean Saadé Fine Jewelry at via de'Cechi 6r. Jean designs and manufactures most of the jewelry he sells. We were looking for a few small gifts and as usual found exactly what we needed. Best of all we enjoyed the opportunity to visit and renew our friendship with Jean. We were heading for the market in Piazza L. Ghiberti for lunch and as we passed our favorite pizza place, Il Pizzaiuolo on via de Macci, 113r the smell of fresh pizza baking changed our plans. Theirs is as close to Napoli pizza as one can get without being there. The dough, sauce and baking technique are quite authentic. We shared a Margherita and a Parmigiana and left happy campers. The offerings other than pizza always look quite good and one of these days we'll have to give them a try. It's a cute, fun osteria. 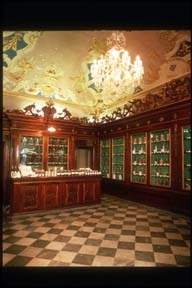 Last year our Swiss friends had introduced us to the unique Officina Profumo - Farmaceutica di S. Maria Novella located at via della Scala 16, just off of Piazza S. Maria Novella. The history of the Pharmacy of Santa Maria Novella is closely linked to the history of the Dominican monastery of Santa Maria Novella for its strictly monastic origin is connected to the noble religious ideal of charity, including the loving care and assistance to the sick. The pharmaceutical activity of the friars began shortly after 1221. It was the year they established themselves in Firenze in the small church of Santa Maria Fra le Vigne, the old name of Santa Maria Novella. The first definite reference to the production of herbal medications in the monastery dates back to 1381. It was in 1457 that the practice of distilling with herbs and roses began. The pharmacy evolved over the centuries. In the 17th century it produced chemical products that were sold all over Italy and the world. The most popular were creams, soaps and fragrances. The fame spread and sophisticated travelers made their way to the pharmacy. The evolution continued and in 1867 the ownership of the pharmacy passed from the hands of the Dominican friars to a layman. The descendants of the family have succeeded in preserving both the heritage of the formulae of the products and the appearance of the Florentine monastery pharmacy which includes many important works of art. The entrance to the pharmacy on via della Scala is through a striking round arched Pietra Serena doorway, crowned by a Dominican emblem of the monks, characterized by a radiant sun, which has become the emblem of the surrounding area. One is immediately struck by the scents of the perfumes. 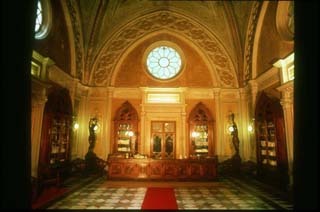 The sales room was one of the monastery's most splendid chapels. The Gothic ceiling filled with frescoes by Paloino Sarti portraying the personifications of the four corners of the earth. There are eight walnut cupboards with glass doors containing exquisite 19th century bottles of the different colored essences and products for sale. The sales counter is decorated with neo-Gothic panels and 2 bronze sculptures of young maidens bearing lamps in Art Nouveau style. To the right are rooms built between the infirmary and the chapel of San Niccolo, originally intended to serve as a private apartment. It is believed that at one period these rooms housed the laboratory. The large airy room that opens to a garden is still furnished in Directoire style from the 18th century. On the walls are portraits of the monks and laymen who oversaw the pharmacy over the centuries. The ancient pharmacy is to the left. It was given this name because from the 17th century until 1848 it was here that products manufactured in the workshop were displayed and sold. The room has splendid stucco decorations on the vaulted ceiling. Inside the glass fronted cupboards are the original jars of the pharmacy. In the show cases are several mortars in bronze and marble. There are displays of old equipment and machinery in the backrooms where some production was done. All of this forms a unique setting for the display and selling of a variety of high quality products guaranteed by the fact that all the officinal herbs used are cultivated with natural techniques without the use of pesticides and tightly controlled. The dried extracts used for the tablets, capsules and syrups are certified and titrated. The honeys and fruit compotes are of biological origin. The compotes contain a minimum of 70% fruit and no sucrose. The product range includes; elixirs, tinctures, propolis, mixed herb infusions, fruit compotes, alimentary integrators, teas, honey, syrups, treatments for face and body, oral and dental hygiene, soaps, sweets and other products. We were able to arrange a visit to the laboratory and factory that brought to life the excellence of the products. No mass production here. Every item is individually hand produced from secret formulae. Machines are used for soap production and perfume bottling. The packaging and labeling is all done by hand. The laboratory constantly checks the quality of all products as they are produced. The facility is spotlessly clean and the staff seems dedicated to its mission of providing top quality, unusual offerings. Our dinner that night at the J.K.Place restaurant, called Lounge, adjacent to the hotel was marvelous. The design and style match that of the hotel, elegant and sophisticated. A small sitting area with a fireplace and three tables at the front of the restaurant is very welcoming. The main part of the dining room has long banquets with pillows along the high walls, which are hung with smart architectural drawings. The furniture and fabrics are of high quality and well chosen to reflect the attitude of the room. There is a stunning lounge on the lower level. The narrow space is lined with pillowed banquets and tables. Back-lighting creates a smashing and dramatic soft pink effect. This is a great place to linger before and after dinner. This environment called for us to start with an aperitif, Campari with orange juice for Linda and Campari on the rocks with a twist of lemon for me. The house offered an unusual and wonderful appetizer, fried radicchio cake with a broccoli cream sided with orange marmalade and celery. The assortment of house made breads was the best yet. We had heard that Lounge had a top notch bistecca. That's why we were here - to conduct the battle of the bistecca - Lounge vs. Buca Lapi. To be fair we started with a pasta primi, spaghettoni artigianali aglio, olio, peperoncino, pomodoro e basilico. This simple recipe was perfectly executed and marvelous. A mixed salad of new greens, fennel, carrot, pepper, cuke and olive oil was a welcome change in our diet. Linda passed on wine so I settled in with a glass of very nice Chianti Classico Reserva. The head chef, Massimo, presented us with the raw bistecca. We were petrified, it was huge. It seems their steaks are delivered prepackaged in one size. The decision was made, the battle must go on. The waiters here do not need to be artists with the knife, the artistry takes place in the kitchen. The presentation was awesome. The thick slices of steak were fanned in a circle with the large bone standing tall in the middle. This was a very excellent bistecca. It did not quite meet the standard of crisp outside, juicy interior and remarkable natural flavor of the previous evening's competitor. This did not stop us from finishing all but two slices. The side of mashed potato was sensational. Chocolate was again calling. Tonight it was an exquisite presentation of a warm chocolate cake filled with a thick chocolate sauce on a pool of saffron English cream along with two chocolate cups filled with Clementines and vanilla ice cream. Oh yes, a few raspberries and alkekenge decorated the plate. Placing second in the battle was no disgrace, the bistecca is worth going for. The meal and service was excellent.